For those unaware of who Judas is... we'll get there soon enough. Let's just he's probably the only person Kire is horribly afraid of. 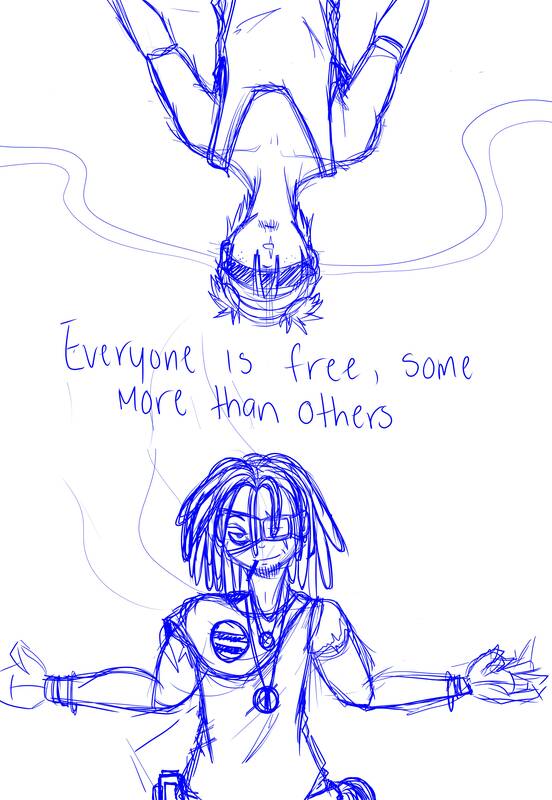 Judas believes that being free has consequences, and those who take action and expand their freedoms are the ones who prosper in the end. The things he made Kire do and the pain he's inflicted on him left Kire blind and broken. Glad you are pumping out content left and right! There is a lot of things to unpack here, so I’ll address each drawing one by one. I have known you for about 7 years or so, and honestly, your drawings had improved dramatically since then. You were able to strengthen your craft, redefine your perspectives and focuses largely on improving your anatomy (a powerful skill any artist should have; for example, the drawing of Kire hiding behind Jaz due to being afraid of animals is, I think, is a good way to described decent anatomy of the human body, Evelyn’s Martial Artist drawing is on the nose too). You have your own style, which showcase your commitment and dedication of improving your ability. If you keep this up, you will continue to improve! Kire and Vegetto comic is quite hilarious! I know you said that Toriyama’s style is rough around the edges, mainly because of his angular style (although recent years, Toriyama’s style soften and went to curves slightly), but this is a good way to replicate such. It’s not exactly like Toriyama, but it’s enough to understand who these characters are. Can’t wait to see the final draft of it! Speaking of comic, the Kire and Evelyn comic is adorable. I do like the panel composition you went there. It’s short but it establishes the narrative you are trying to show here. Very good. Kire and Juda’s drawing is pretty damn awesome! I think the only thing I would suggest is working on balancing the eyes. Sometimes they’re either too small or slightly off a bit. Align them a bit and you’re good to do (and sometimes, make them bigger in correspond of how the face is built). Though, it seems that it only happens sometimes. In Marie’s drawing, her eyes are good and balance, but Edwin’s drawing, it seems to be slightly smaller on his face. Keep those in mind! Zenta is perhaps my favorite work so far, so I want to see this one being completed the most.